Gossypium hirsutum accounts for 90% of cotton fibre production. Gossypium barbadense accounts for 5% of cotton production. This species yields the finest cotton quality. Gossypium herbaceum and Gossypium arboreum yield lower quality cotton with shorter and thicker fibres. These species are mainly grown in India, and in the drier parts of Africa and Asia. Cotton is a multipurpose crop cultivated for its highly valuable textile fibre (lint). Textiles made of cotton lint are strong, comfortable, washable and printable (O'Brien et al., 2005). Cotton has been domesticated for this purpose since ancient times in both hemispheres, and in both Old and New Worlds (it is cited in early Bible manuscripts; OGTR, 2008). 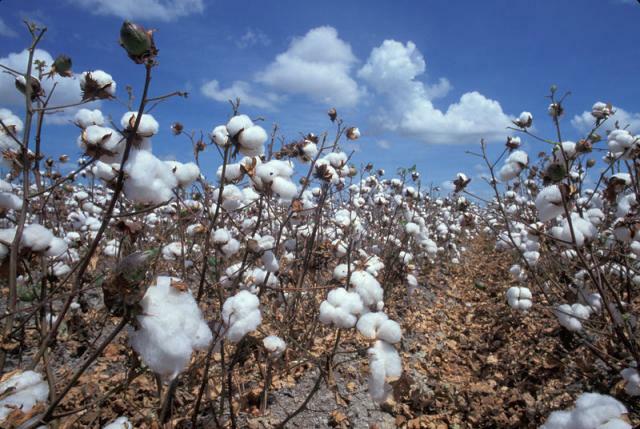 The name cotton comes from the Arabic word qutn قطن, which refers to species that produce fibres on their seed coats that can be spun (Lee, 1984 cited by OGTR, 2008). Cotton is the most important textile fibre crop in the world (FAO, 2012). Another important cotton product is cottonseed oil, which dominated the U.S. and world edible oil markets until just before World War II, when it was displaced by soybean oil (O'Brien et al., 2005). Cotton is still the fourth most important oil crop in the world, after soybean, rapeseed and oil palm (FAO, 2012). Cultivated Gossypium species encompass hundreds of varieties, including genetically modified cultivars (Ikitoo, 2011; OGTR, 2008). Cotton is a perennial plant cultivated as an annual. It is an erect branched shrub, up to 3 m high. The cotton plant has an indeterminate growth habit, in that its vegetative and reproductive developments occur at the same time, resulting in difficult management operations, such as the application of fertilizer or irrigation (Smith et al., 1999). The leaves are spirally arranged on the stems. They are generally palmate with 3 or 5 lobes, pubescent to glabrous. The flowers are solitary, pentamerous, white to pale yellow in colour, and rarely tinted with purple in the center. They are borne on 1-4 cm long pedicels and wrapped into three bracteoles that remain around the fruit after pollination. The fruit (called a "boll") is a capsule, 2-5 cm long x 1-1.5 cm broad, that splits open when mature. Each capsule contains many seeds covered with a thick coat of hairs (Ikitoo, 2011). The long fibres (lint) are separated from the seeds mechanically, using a machine called a cotton gin. In addition to fibre, cotton processing yields other products used for food, feed and industrial purposes. Cottonseed oil is a cooking oil extracted from cotton seeds. Whole cotton seeds are used for oil extraction or for animal feeding. Cottonseed meal is the by-product of cottonseed oil extraction. It is a protein-rich feed used to feed livestock, particularly ruminants. Cottonseed hulls are the outer coverings of cotton seeds, and the by-product of the dehulling step in cottonseed oil extraction. They are a fibrous product used to feed ruminants. Linters are the short hairs still adhering to the cotton seed after ginning. Cotton wood and forage is the by-product of the cotton harvest. It includes the main stalks, side branches, leaves, bolls, and seeds with linters. This product is usually incinerated or abandoned as waste, though it may be used to feed ruminants. Cotton gin by-product (cotton gin trash) is the by-product of the ginning process. It consists in a mixture of cotton burrs (husks), leaves, stems, lint, immature seeds, and dirt. This product can be used to feed ruminants (Blasi et al., 2002). A typical cottonseed crushing operation separates the seed into oil (16%), hulls (26%), meal (45.5%) and linters (8.5%) (O'Brien et al., 2005). The origins of cotton are unclear. Known areas of origin include Mexico, Northeast Africa, the Arabian Peninsula and Australia. The presence of tetraploid species (G. hirsutum and G. barbadense) in America suggests that contact occurred between diploid parents, before continental separation or during glaciations (OGTR, 2008). Cotton fibre was used 8000 years ago in Pakistan and 7800 years ago in Mexico. Nowadays, cotton is grown in more than 50 countries worldwide (Smith et al., 1999). In 2010, 32 million ha were used for the cotton crop. The top 10 producers (India, China, USA, Pakistan, Uzbekistan, Brazil, Turkmenistan, Turkey, Burkina Faso and Argentina) accounted for 84% of the total land area devoted to cotton (FAO, 2012). Cotton plant is a warm season crop. It is cultivated from 47°N to 32°S, from sea level to an altitude of 1500 m (up to 2000 m in tropical Africa). Optimal growth occurs between 25 and 30°C, in areas where rainfall during the growing season is 750-1200 mm and where a dry period occurs during fruit ripening. Cotton does not grow well under heavy rains (Ecocrop, 2012). It is tolerant of drought but is sensitive to frost, wind and shade (Ecocrop, 2012; Ikitoo, 2011). Cotton does well on light to heavy, well-drained soils with a pH between 6 and 7.5. Cotton tolerates soil salinity (0.5-0.6%) (Ikitoo, 2011). The cotton plant is susceptible to many diseases, pests and weeds. 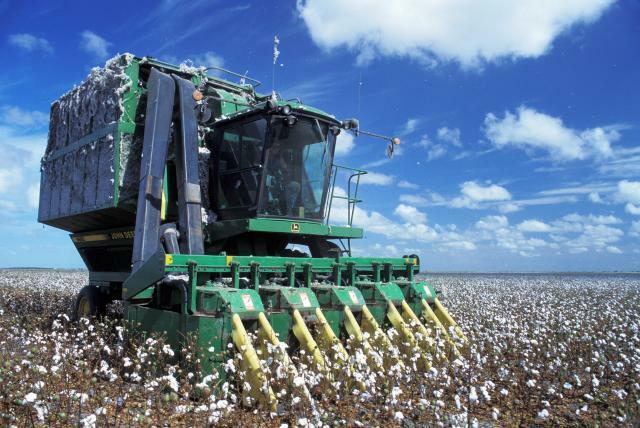 Cotton production requires large amounts of pesticides and herbicides throughout the growing season, resulting in residues in the environment and in cotton products (Edwards et al., 2009). Cotton is one of the leading crops to be genetically engineered. Genetically-modified Bt cotton resistant to various insect species (notably bollworm moths) was introduced in 1996 and other GM cotton cultivars (notably herbicide-resistant ones) have been released since (O'Brien et al., 2005). Genetically modified cotton is widely grown and represented 65% of the total cotton planted worldwide in 2010 (21 million ha out of 32.3 million) (Ikitoo, 2011; USDA, 2010). The main expected environmental benefit from the use of Bt cotton is a reduction in pesticide use and in residues in the environment, feeds and foods (Edwards et al., 2009). Animal studies have failed to demonstrate noxious side-effects to the use of GM cotton (EFSA GMO Panel, 2008). However, like for other GM crops, both the environmental benefits of GM cotton and its effects on health remain highly controversial and a matter of debate. Gossypol is a toxic yellow pigment found commonly in cotton (Gossypium genus) and other species of the Malvacae family. In the cotton plant, gossypol is mostly contained in special glands localized in the seed kernel, though other parts of the plant, including the seed hulls, leaves, stems and roots also contain gossypol. Gossypol plays an important role in plant protection against predators (mice, insects), diseases (bacteria and viruses) and parasites (root knot nematode) (Morgan, 1989; Blasi et al., 2002). Gossypol is a polyphenolic compound that exists in free and bound forms: the free form (soluble in 70-30 v/v aqueous acetone) is physiologically active and toxic whereas the protein-bound form is non-toxic (Morgan, 1989). Total gossypol content in cotton seeds is highly variable and ranges from 0 to 9% (when including wild Gossypium species) (Benbouza et al., 2002). Gossypol content depends on species, cultivars, fertilizer rates, growing conditions, and insect pressure (Blasi et al., 2002; Randel et al., 1992; Carter et al., 1966). The two main cotton species, Gossypium hirsutum and Gossypium barbedense, both contain variable amounts of gossypol, G. barbadense being the richer (OGTR, 2008). In Gossypium hirsutum seeds, gossypol concentrations ranging from 0.6 to 1.15% DM have been reported (OGTR, 2008). In the kernels, gossypol content could range from 0.4 to 1.7% DM (European Commission, 2003). Cotton varieties that produce little or no gossypol have existed for many years and glandless varieties have been developed since the 1950s, with the idea of using the cottonseed products more widely for food and feed. However, such varieties tend to be more sensitive to pests and less productive and have thus been found less economically viable. Investigations on glandless cotton are still ongoing, either using traditional selection methods (Rodman, 2006) or gene-silencing techniques (Bourzac, 2006). Free gossypol is the most important form of gossypol in unprocessed seeds: free gossypol content was reported to be in the range of 0.05 to 0.7% DM in Gossypium hirsutum seeds (OGTR, 2008; EFSA, 2008). 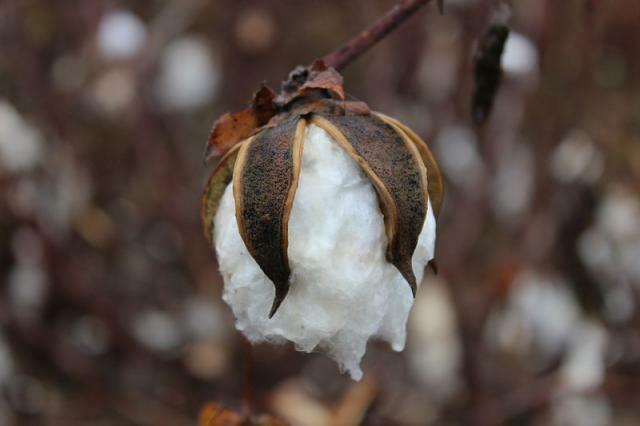 In addition to genetics, growing conditions and environmental conditions, the free gossypol content of cotton products may depend on processing: heating, for instance, increases gossypol binding and reduces toxicity, whereas fine grinding breaks the gossypol glands, releasing gossypol in the product. Free gossypol causes moderate acute toxicity in animals. The LD50 are 2400-3340 mg/kg for rats, 500-950 mg/kg for mice, 350-600 mg/kg for rabbits, 550 mg/kg for pigs and 280-300 mg/kg for guinea pigs (EFSA, 2008). Signs of acute gossypol toxicity include constipation, dyspnoea, anorexia and loss of weight. Death usually results from circulatory failure. Although acute toxicity is uncommon, ingestion of small amounts over a prolonged period can be lethal (European Commission, 2003). In rats and humans, repeated exposure to lower doses of gossypol mostly affects the testis in males (reduced sperm motility, inhibited spermatogenesis and depressed sperm counts) and reproductive organs and embryo development in females (EFSA, 2008). The effects of gossypol on animal health and performance depend on the type of animal. In mature ruminants, breakdown and maceration by chewing and exposure of free gossypol to rumen microorganisms causes deactivation, binding to amino nitrogen or to metal ions such as iron, and degradation that renders the gossypol unavailable to the animal, thus protecting it from the toxic effects of gossypol. However, young ruminants with an immature rumen do not benefit from this protection and are thus more sensitive to gossypol (Blasi et al., 2002 ; Poore et al., 1998). Monogastrics are also particularly sensitive to gossypol, which limits the use of cottonseed products in these species unless they have been properly detoxified. In pigs and poultry, it is possible to alleviate gossypol toxicity through the addition of iron salts to the diet. Iron salts, such as ferrous sulphate, are effective in blocking the toxic effect of dietary gossypol, possibly by forming a strong complex between iron and gossypol and thus preventing gossypol absorption (EFSA, 2008).